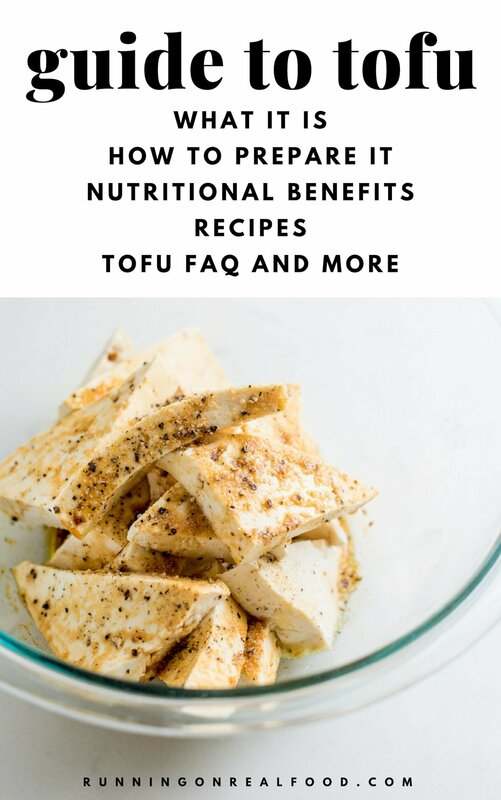 This post covers everything you need to know about tofu including what its made of, its health benefits, how to prepare it, frequently asked questions and the best type of tofu for frying, baking and more. We’ll also discuss tempeh and natto, two other soybean products that make a protein-rich addition to a healthy diet. Tofu, also known as bean curd, is made from soy or more specifically, from soybean milk. White soybeans are boiled and curdled and the resulting curds are pressed into the white blocks of tofu that we see in stores. Its high protein content makes it a great choice if you eat a plant-based diet. Tofu doesn’t taste like much. If anything, it’s ever so slightly “beany” tasting, much like edamame, plain soy milk or soybeans. Although it’s bland on its own, tofu easily absorbs flavor so it’s best marinated or seasoned to suit whatever dish you’re using it in. You can make tofu taste like just about anything through various cooking and preparation methods. It’s blandness actually makes it a great choice for baking, dressings and dips to add texture and volume, or even replace ingredients like oil, eggs and dairy. Tofu is a good source of protein, which is why I include it in my diet. It contains all essential amino acids, making it a complete protein. It’s also a good source of iron, manganese, selenium, magnesium, copper, zinc and vitamin B1. 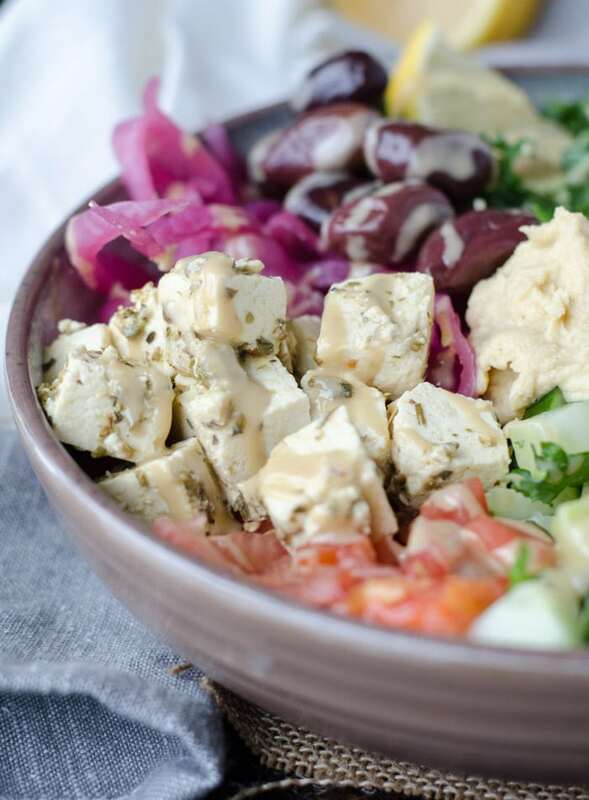 Extra-firm tofu has the highest protein content but also the highest fat content. I use firm tofu most of the time unless I’m using it in baking or for sauces, then I’ll use soft tofu. We’ll get into the different types of tofu below but before we do, let’s take a quick look at two other popular soy products: tempeh and natto. First of all, let me say that I love tempeh! Tempeh is my favourite soy product. It’s made from cooked and fermented soybeans that are formed into a patty that’s typically sold in blocks. Tempeh has it’s own unique, nutty taste, unlike tofu, which doesn’t really have a flavour of its own. Tempeh is high in protein, calcium and phytochemicals and has a firm texture that’s often used as a substitute for meat. It doesn’t crumble in the same way that tofu does, so I usually cut it into slabs or cubes for adding to recipes, although it does work great coarsely crumbled into dishes like chili. You can cut it into small cubes, fry them up in a pan and add them to salads, soups and stir-fries or you can make larger slabs of tempeh and add them to things like sandwiches. I love it pan-fried until crispy or baked in a sauce and added to salads. It definitely has a unique taste that takes some getting used to but I really love it and it’s a good way to include fermented foods in your diet. Natto is one soy product you may not have heard of before. Much like tempeh, natto is fermented with a rich probiotic content, making it good for digestion and gut health. It’s made from soaking whole soybeans, cooking them and then adding bacteria to the cooked beans so they can ferment. Even more so than tempeh, natto is definitely not for everybody. It has a strong smell and peculiar, gooey, stringy texture. Sounds delicious, doesn’t it? However, if you can get past the smell, natto is highly nutritious and a very good source of protein, fiber, vitamins and minerals, in particular, calcium which isn’t always the easiest to get if you eat a plant-based diet. It’s rich in B vitamins, iron, copper, zinc and magnesium too. One other reason natto is so good for you is its rich vitamin K content. Vitamin K is important for a healthy heart as it has been shown to prevent hardening of the arteries. Vitamin K has also been shown to prevent age-related neurological degeneration and prevent kidney stones. There are two main kinds of tofu: silken and regular. They both come in different firmnesses from soft to extra-firm. Silk tofu, or Japanese-style tofu is much softer than regular tofu, so it requires more careful handling. Regular tofu, or bean curd, is much more common than silken tofu. Regular tofu you is what you’d typically find in the refrigerator or produce section of most grocery stores. Tofu varieties differ by how much water is pressed out of them. The more water that’s pressed out, the firmer the tofu gets. This is why as the firmness increases, so does the fat and protein content. There’s less water and more actual tofu, even though the size is the same. For most recipes, you’ll want to use regular tofu in either medium, firm or extra-firm. There isn’t a huge difference between the three but if you want the tofu to retain its shape, firm or extra-firm tofu is best. You can eat any tofu raw such as in my caesar salad dressing or tofu feta but I usually eat tofu cooked in some way. Crispy baked or dry-fried tofu is my go-to. Let’s get into the different types of tofu available and what their best used for. Extra-firm tofu is best for recipes where you want the tofu to hold its shape. Extra-firm tofu is sturdy and will hold together regardless of cooking method. It can be sliced, cubed, fried, baked, grilled or crumbled. Extra-firm tofu won’t absorb as much flavour as medium or firm tofu, so it can be helpful to marinate it before preparing. 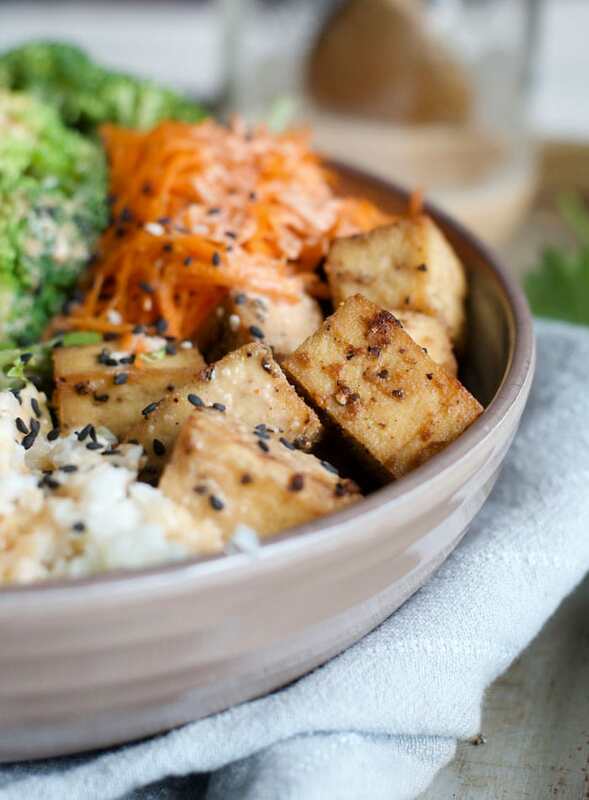 Firm tofu absorbs flavour well and can be stir-fried, baked, cubed and just about anything else when you want your tofu to retain its shape. It can be also used for tofu scramble and creating dairy-free versions of certain cheeses such as ricotta. 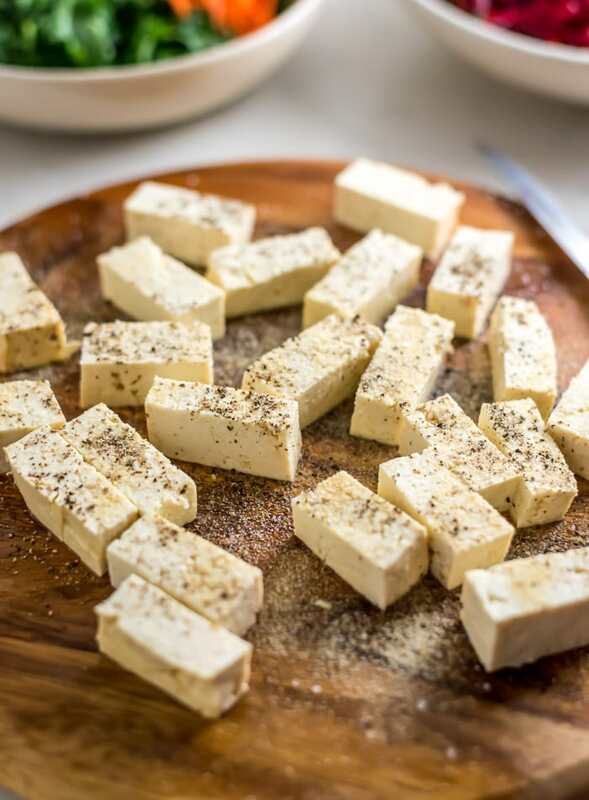 Medium tofu is more delicate than firm and can easily fall apart when handled however it’s still great for stir-fries or marinated tofu recipes when you want the tofu to absorb a lot of flavour. It can be used in soups like miso, served cold and marinated and used in baking. I sometimes bake medium tofu but I prefer firm tofu for this purpose. Soft tofu is best for blending into baking, smoothies, raw desserts, dips and sauces. I use soft tofu a lot as a replacement for dairy in creamy dressings such as caesar salad dressing. Smoked tofu is simply a smoked tofu with a firm, meaty texture and smoky flavour. You can use it in sandwiches or anywhere else as an alternative to meat or dairy. It’s ready to eat right out of the package. I don’t really love the flavour of smoked tofu so I’ve only bought it a couple times. You could make your own smoked tofu if you have a smoker or gas grill. Silken tofu is undrained and unpressed tofu and has a higher water content than other tofu varieties. I don’t see silken tofu in stores very often so if a recipe calls for it, I usually just use soft tofu. Silken tofu does come in soft, firm and extra-firm but I haven’t noticed much of a difference between them. Silken tofu sometimes comes sold in tubes and if you can’t find it in a regular grocery store, it should be available in an Asian food store. Note that silken tofu doesn’t require refrigeration so you may need to ask where it’s kept if you can’t find it. Silken tofu is not curdled like regular tofu making it much more delicate. It’s a little touchy and crumbles easily so be careful when handling it if you’re trying to keep it intact. Otherwise just toss it into the blender if you’re using it in something like a vegan cheesecake, smoothie or raw dessert. Silken tofu is best for used in foods like dressings, sauces, smoothies and desserts. It can also be used in baking to replace things like cream, oil or eggs. In addition to the main types of tofu y0u’d find in North America, there are a ton of different kinds used in Asian cuisines. I’m not familiar with them though and have no experience cooking with them. This includes processed tofu such as fried, dried, fermented and frozen. There are also tofu varieties that aren’t made with soybeans. This includes almond tofu, egg tofu, sesame tofu, peanut tofu and even Burmese tofu which is made from chickpea flour. There are many different ways you can prepare tofu. It can be cooked by itself, added to recipes, used in baking, marinated, fried, baked, blended, breaded and more. Tofu can be cubed and tossed into soup, it can be breaded and baked, it can be fried and it can even be eaten right out of the package. This is quite common with medium tofu served topped with sauce, as you might find in Japanese cuisine. You can also toss soft and medium tofu right into a smoothie for extra protein and creaminess. Deep fried or pan-fried tofu will, of course, give you the crispiest texture but oil-coated tofu isn’t something you want to eat on a regular basis. You’ll find tofu prepared this way in restaurants and of course, it’s delicious however when preparing tofu at home, I usually bake it or dry-fry it in a pan. Marinate it. For the most flavorful tofu, marinating it first to allow the flavors to absorb is your best bet. Even just a splash of soy sauce or tamarin, garlic powder and pepper work wells for a marinade. Press it. Pressing the excess water out of tofu first helps it absorb more flavor and improves the crispiness when baked for fried. Head down to the tofu FAQ for how to press tofu. My favorite way to prepare tofu is baking it. Cube tofu and place in a bowl with a splash of soy sauce, garlic powder and pepper. Mix to combine so each piece is coated. Bake for about 20 minutes, flip and continue baking until brown and crispy. Follow the baking steps above but instead of using soy sauce, pepper and garlic powder, marinate the tofu in BBQ for a couple of hours before baking. 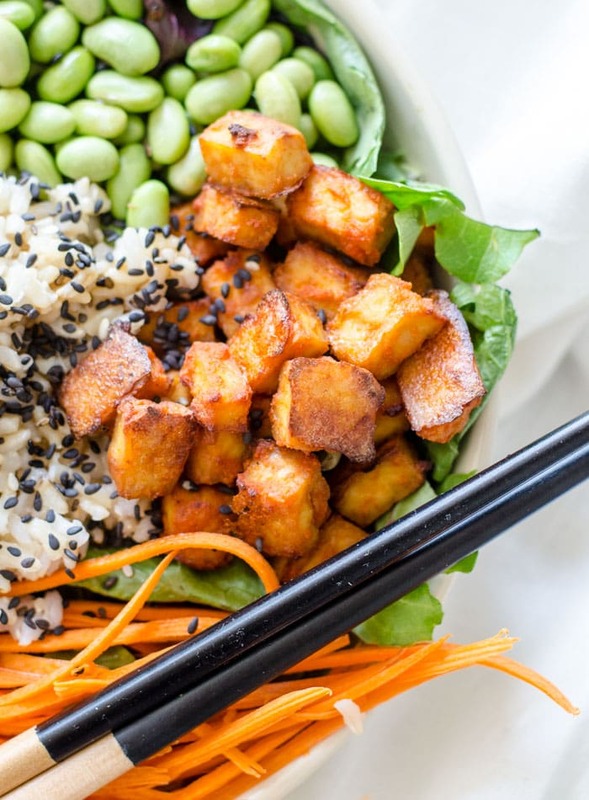 Follow the baking steps above but instead of using soy sauce, pepper, and garlic powder, marinate the tofu in equal parts soy sauce, maple syrup and sesame oil and 1 tsp of garlic powder for a couple of hours before baking. Frying tofu is simple. 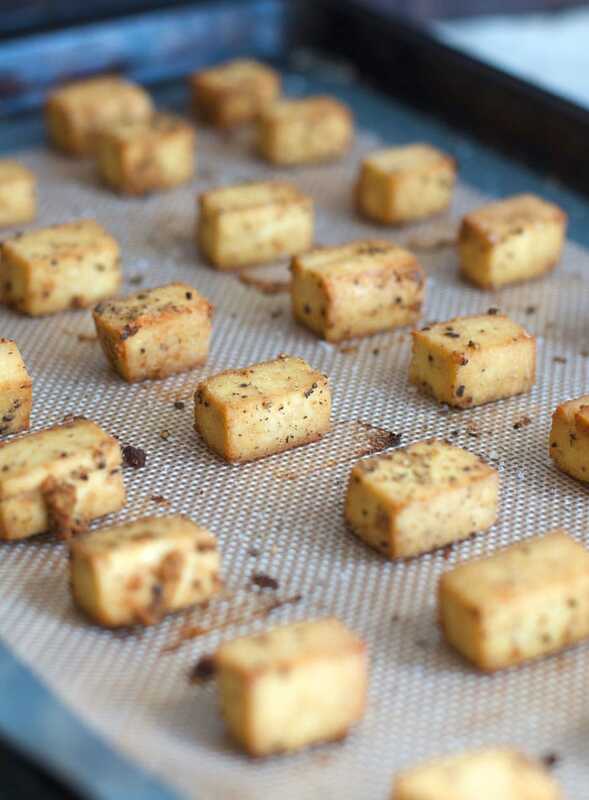 Mix cubed tofu with desired spices then fry in a pan with a bit of coconut or avocado oil. Allow it to sit on each side until browned, then stir and repeat until all sides are crispy and brown. 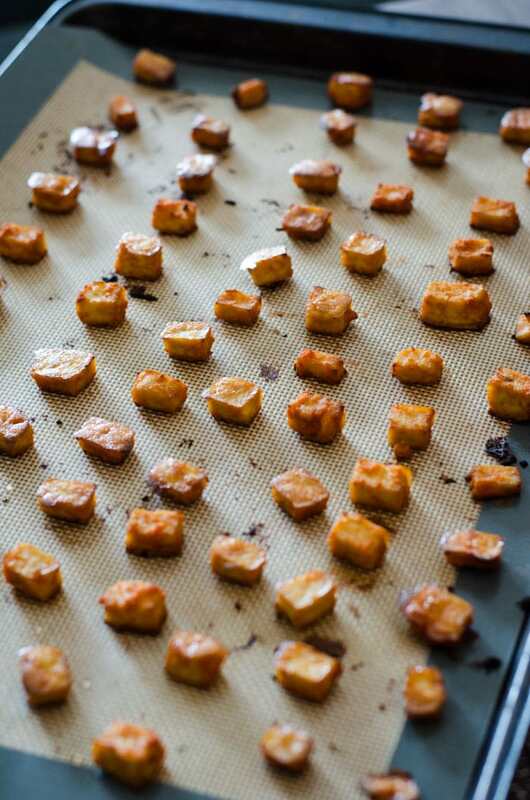 Aside from baking, a quick “dry-fry” is my other go-to method for making tofu. To make tofu in a pan without oil, cube tofu and toss with desired spices then add to a hot non-stick pan and “fry” until browned on all sides. Yes, you can freeze tofu! Frozen tofu can be stored for up to 3 months. Cut it into chunks and freeze on a parchment-lined tray. Once it’s solid, transfer it to a freezer-safe container or bag. Frozen tofu can be defrosted in the fridge. Freezing tofu does change the texture slightly but I don’t notice too big of a difference. Do you have to cook tofu? Nope! Tofu can be eaten straight from the package, however, it’s most often prepared in a way to improve the flavor and texture. That being said, I use raw tofu often in dressings and sauces. Do you have to press tofu? To press tofu, wrap it in a dishcloth and place a few heavy objects on top of it. It may leak a little so I’d suggest placing it on a plate. I usually use cookbooks as my heavy object. Let it sit like that for 20-30 minutes to allow any excess water to be squeezed out. After pressing, use the tofu as normal. Store unopened tofu in the refrigerator until ready to use. Place the leftover tofu in a sealed container covered with water. You can change the water daily to keep the tofu as fresh as possible though it’s not a big deal if you miss a few days. Packaged tofu has quite a long expiry date when unopened so just check the package for the best before date. Once you’ve opened the package, you can store any leftover tofu in the fridge for up to 1 week. Plain tofu is naturally gluten-free. It contains soybeans, water and a curdling agent, all of which are gluten-free. If you’re purchasing a flavoured, breaded or otherwise prepared tofu, check the package for gluten-containing ingredients. Should I buy organic tofu? Personally, I always buy organic tofu. It’s just one of those foods I feel more comfortable eating organic and fortunately organic tofu is about the same price as it’s non-organic counterparts. Yes, since tofu is made without the use of any animal products, it is considered vegan. I eat organic tofu and tempeh regularly as a source of protein in my plant-based diet. For more information on vegan nutrition, you can read my vegan nutrition guide and guide to vegan proteins. If you’re interested in learning more about a plant-based diet, I’d suggest reading my tips for plant-based beginners and post about how to transition to a plant-based diet. Should I buy non-GMO tofu? Most tofu found in stores is non-GMO. We hear a lot about genetically modified soy and yes, upwards of 90% of soy crops are GMO but most of it is the soy used for animal feed. If you’re concerned, look for tofu with a non-GMO certified label. Any tofu I’ve ever bought has the non-GMO label on it. It’s not hard to find. Sprouted tofu is made from sprouted soybeans making it easier to digest. I buy sprouted tofu when I can find it. Other than digestibility and a slight difference in nutrition, it’s the same as regular tofu as far as cooking and preparation methods. Can you make your own tofu? I’ve never made tofu but you can make your own tofu at home with tofu and a coagulant. Check out this detailed tutorial for how to make tofu from Cultures for Health. I hope that answered most of your questions about tofu! If you have any other questions about, please let me know in the comments. Thank you for the guide! I have eaten very little tofu so far. Mostly, because I never took the time to understand how to use it. I will save this post for reference and will try to introduce tofu in my diet again. Firm Tofu all the way. I used it a lot when I transitioned from a meat to vegetarian diet and helped a lot. Great guide. Very helpful! We try to do at least 2 meatless days per week, so this is great inspiration for night! You’re welcome. Happy Meatless Meals!